o r i g i nat i o n s e r v i c i n g a na ly t i c s s e c o n da r y M a r k e t ORIGINATION 38 | Th e M Rep o RT the latest Mortgage originations drop 31 Percent in 2014, HMda data Finds A declining refinance market is largely responsible for the fall in mortgage originations last year. M ortgage loans declined 31 percent from 8.7 million to 6.0 million 2014, compared to the previous year. A recent report from the Federal Financial Institutions Examination Council (FFIEC) found a decline in refinance origi- nations pushed mortgage origina- tions down in 2014. Refinance originations de- creased by 55 percent or 2.8 million as interest rates in 2014 remained above low levels re- corded in 2013. Meanwhile, home purchase lending rose by about 4.0 percent, the FFIEC reported. "In 2014, house prices continued their upward trend evident since 2012 and mortgage interest rates declined throughout the year, although rates remained slightly higher than the historical lows reached in late 2012 and early 2013," the report said. The FFIEC's mortgage lending data comes from transactions at 7,062 U.S. financial institutions covered by the Home Mortgage Disclosure Act (HMDA), which include banks, savings associa- tions, credit unions, and mortgage companies. 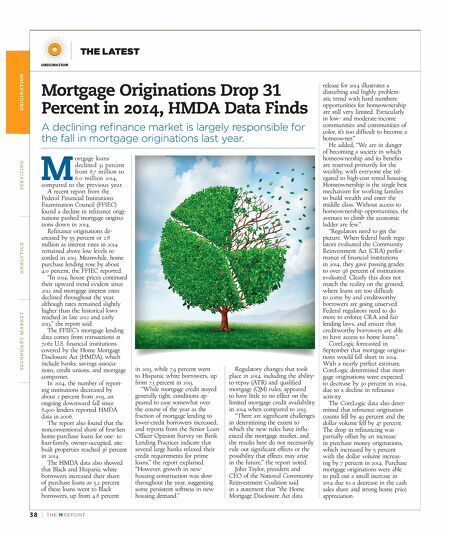 In 2014, the number of report- ing institutions decreased by about 2 percent from 2013, an ongoing downward fall since 8,900 lenders reported HMDA data in 2006. The report also found that the nonconventional share of first-lien home-purchase loans for one- to four-family, owner-occupied, site- built properties reached 36 percent in 2014. The HMDA data also showed that Black and Hispanic white borrowers increased their share of purchase loans as 5.2 percent of these loans went to Black borrowers, up from 4.8 percent in 2013, while 7.9 percent went to Hispanic white borrowers, up from 7.3 percent in 2013. 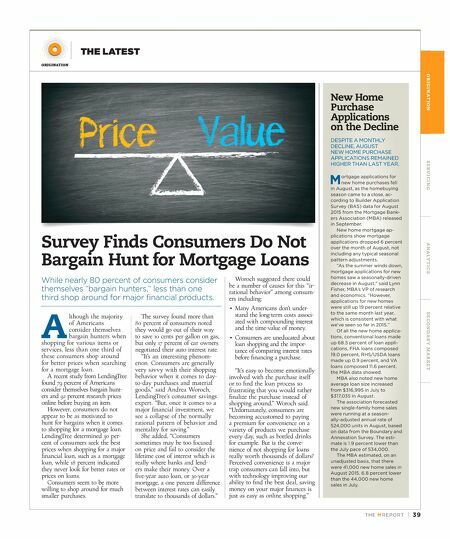 "While mortgage credit stayed generally tight, conditions ap- peared to ease somewhat over the course of the year as the fraction of mortgage lending to lower-credit borrowers increased, and reports from the Senior Loan Officer Opinion Survey on Bank Lending Practices indicate that several large banks relaxed their credit requirements for prime loans," the report explained. "However, growth in new housing construction was slow throughout the year, suggesting some persistent softness in new housing demand." Regulatory changes that took place in 2014, including the ability- to-repay (ATR) and qualified mortgage (QM) rules, appeared to have little to no effect on the limited mortgage credit availability in 2014 when compared to 2013. "There are significant challenges in determining the extent to which the new rules have influ- enced the mortgage market, and the results here do not necessarily rule out significant effects or the possibility that effects may arise in the future," the report noted. John Taylor, president and CEO of the National Community Reinvestment Coalition said in a statement that "the Home Mortgage Disclosure Act data release for 2014 illustrates a disturbing and highly problem- atic trend with hard numbers: opportunities for homeownership are still very limited. Particularly in low- and moderate-income communities and communities of color, it's too difficult to become a homeowner." He added, "We are in danger of becoming a society in which homeownership and its benefits are reserved primarily for the wealthy, with everyone else rel- egated to high-cost rental housing. Homeownership is the single best mechanism for working families to build wealth and enter the middle class. Without access to homeownership opportunities, the avenues to climb the economic ladder are few." "Regulators need to get the picture. When federal bank regu- lators evaluated the Community Reinvestment Act (CRA) perfor- mance of financial institutions in 2014, they gave passing grades to over 98 percent of institutions evaluated. Clearly this does not match the reality on the ground, where loans are too difficult to come by and creditworthy borrowers are going unserved. Federal regulators need to do more to enforce CRA and fair lending laws, and ensure that creditworthy borrowers are able to have access to home loans." CoreLogic forecasted in September that mortgage origina- tions would fall short in 2014. With a nearly perfect estimate, CoreLogic determined that mort- gage originations were expected to decrease by 30 percent in 2014, due to a decline in refinance activity. The CoreLogic data also deter- mined that refinance origination counts fell by 49 percent and the dollar volume fell by 47 percent. The drop in refinancing was partially offset by an increase in purchase money originations, which increased by 5 percent with the dollar volume increas- ing by 7 percent in 2014. Purchase mortgage originations were able to pull out a small increase in 2014 due to a decrease in the cash sales share and strong home price appreciation.